Professor Jacques Charles and the Robert brothers (Les Frères Robert) launched a new, manned hydrogen balloon in Paris from the Jardin des Tuileries. Jame Tytler, completed the first manned balloon flight in The British Isles flying from Abbeyhill to Restalrig while Signor Vincent Lunardi ascended from Moorfields, London to complete the first manned balloon flight in England. Jean-Pierre Blanchard was the first person to fly across the English Channel in a Hot Air Balloon. Eight years later from a prison yard in Philadelphia, Blanchard made the first manned flight of a balloon in America. Balloon enthusiast Charles Green along with two crew members launched the ‘Royal Vauxhall’ from Vauxhall Gardens, crossed the Channel and descended 18 hours later at Weilburg in Nassau, Germany. This record for the longest balloon flight stood until 1907. In Bruning, Nebraska inventor Ed Yost made the first-ever free flight of a modern hot air balloon using a propane-powered burner. After further modifications and improvements to the design and materials, in 1963, Yost piloted the first modern-day balloon across the English Channel with Don Piccard. From RAF Weston-on-the-Green, the Bristol Belle (G-AVTL) the first modern-day hot air balloon built in the UK by members of the Bristol Gliding Club (Bill Malpas, Mark Westwood, Giles Bulmer and Don Cameron) took flight. Don Cameron celebrated the Bristol Belle’s 50th Birthday on 10 July 2017, in Bristol, inflating her on College Green. Richard Branson and adventurer Per Lindstrand channelled the Montgolfier’s ambition and spirit in a bid to cross the Atlantic Ocean. They successfully flew from Sugarloaf, Maine to Limavady, Northern Ireland some 3.075 miles in 31hours and 41 minutes. Ivan Andre Trifonov from Austria piloted Mil 2000 balloon over the South Pole with two Spanish crew members at an altitude of 15,000 ft (4,571m). After six attempts Steve Fossett became the first person to fly around the world, alone and without stopping, in a hot air balloon. He launched the Balloon Spirit of Freedom from Western Australia on the 19th June 2002 and 14 days, 19hours and 50 minutes later he landed back in Australia. So, come and join us as we ascend to 3,000 feet in one of our hot air balloons and gently drift across the stunning scenery and landscapes of the South West! 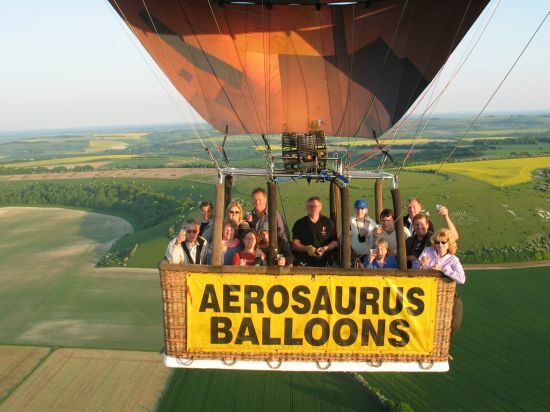 Whether it is your first ride in a Hot Air Balloon or you’re a frequent flyer, our team will make your flight an unforgettable memory. We look forward to flying you soon.